On the brass plaque inside the church it looks like C.M. Rogers. On the war memorial itself G and C are very similar in lettering. 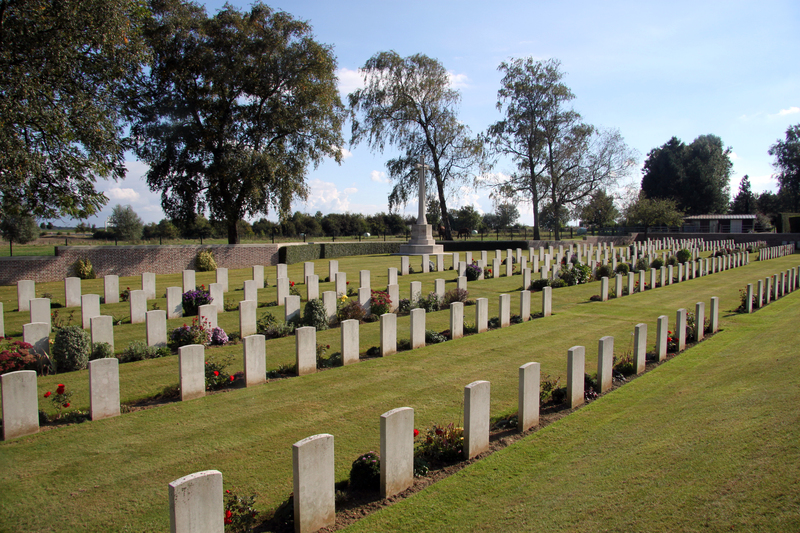 The most likely local match is G. F. Rogers, Flight cadet 137361, RAF / 73 Company Royal Garrison Artillery who died on 30 June 1918, possibly having drowned. 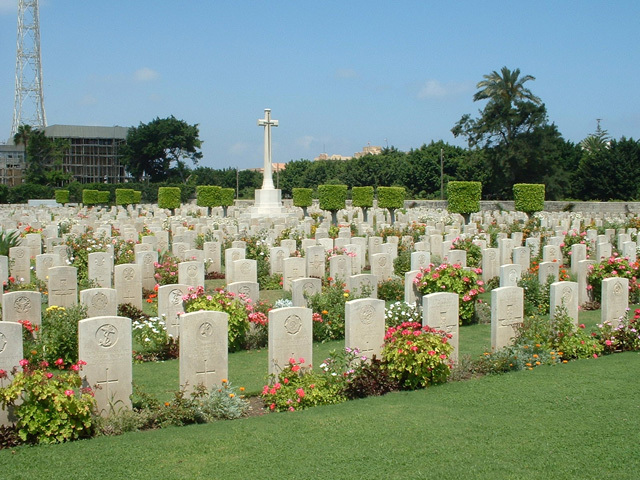 Rogers is buried at grave B65, Alexandria (Hadra) War Memorial Cemetery (a hospital base cemetery) in Egypt. The local connection is his listing as the son of Joseph and Gertude Rogers of Bissoe, Perranwell, and husband of Elsie M. Richards (formerly Rogers), Carnon Downs, Perranwell. Tony Dyson’s 2007 research notes (via Bob Richards) that Elsie M. Rogers his widow remarried between July and September 1920 one Frederick J. Richards. Of the 33 R.Stephens listed on the CWGC website for the First World War, the most likely local match is Sub Lieutenant R. Stephens, HMS Terrible, Royal Navy , who died on 7 February 1919, aged 49. 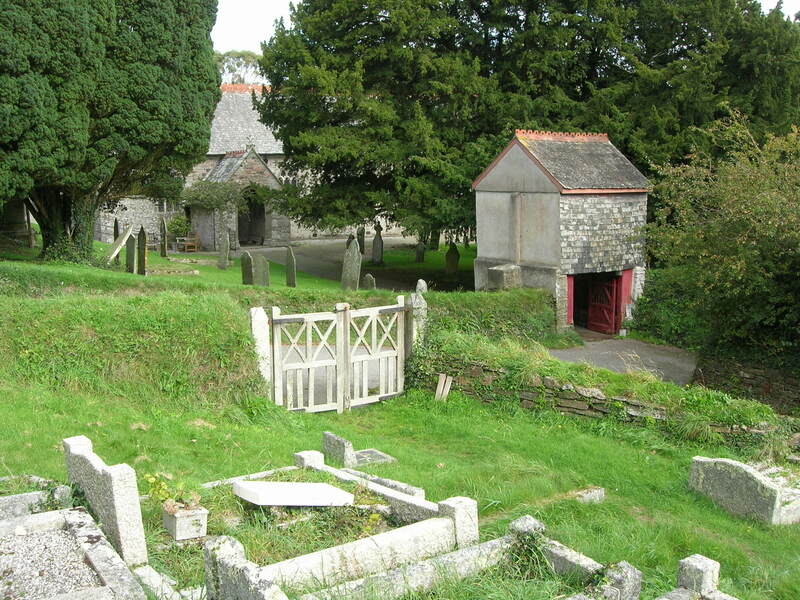 He is buried in Feock Church Cemetery, amongst 2 other local naval casualties from the 1914-1919 period. 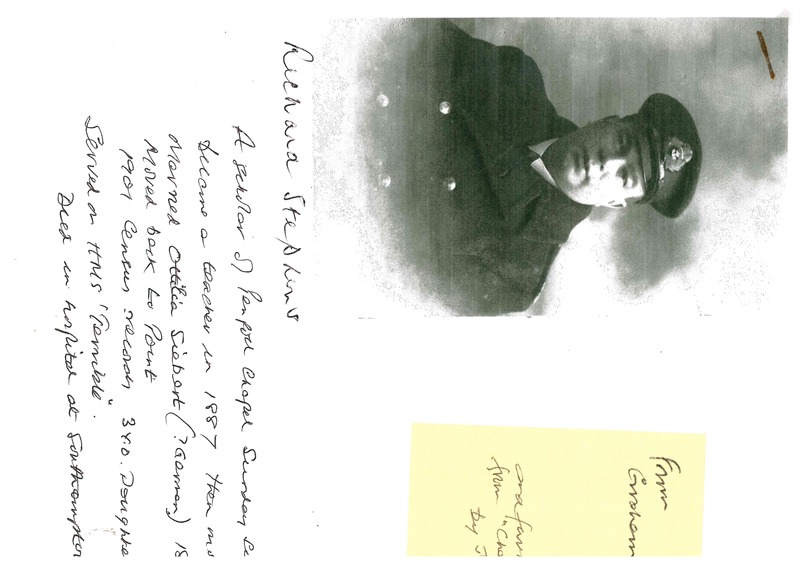 Born around 1870, Stephens is listed as the son of James and Eliza Stephens, as well as husband of Ottilia ‘Tilly’ Stephens of Glenavon, Point, Devoran. All the other First World War names are in alphabetical order. 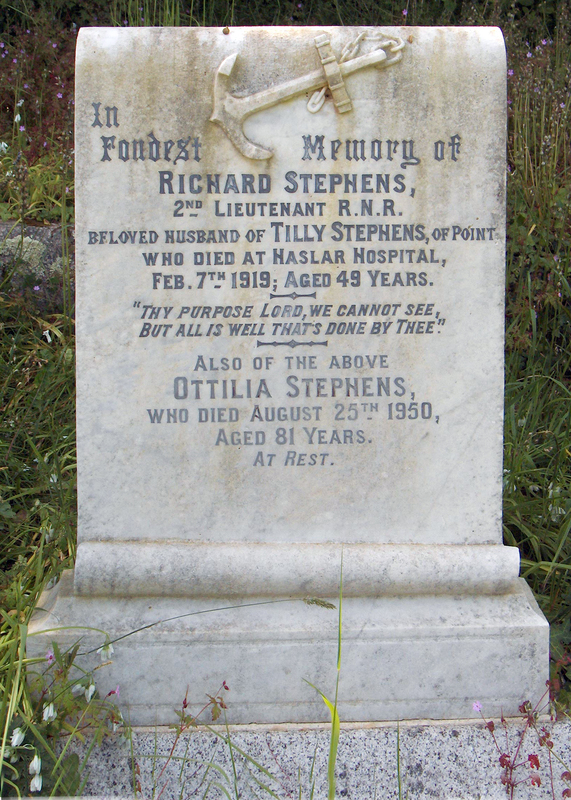 R. Stephens’ name is added on a separate panel round the back of the memorial, above the area of the maker’s name section on what must once have been a blank panel. This maybe because he had died in 1919 after the war (and dedication of the war memorial) . It may be that the parish were expecting further deaths from the effects of war service so left this panel blank Sadly underneath his name instead are the names of the Second World war casualties. Tony Dyson’s 2007 research notes (via Graham Crocker, a relative who still lives at Glenavon) that Stephens is a cousin of the two Crocker casualties from Devoran. According to Graham Crocker and the book “Chapel by The Creek”, Stephens was a scholar of Penpoll Chapel and later became a teacher in 1887 then moved to London. He married Ottilia Siebert (known to Graham as Aunt Tilly) from a German emigre family in 1897. By the 1901 Census, the couple had moved back to Point and the couple had a three year old daughter, Edith (born 1898). Bob Richards suggests that this German emigre connection might account for the late addition to the war memorial. Sweet’s name was added to a Devoran Parish War Memorial in November 2014 as part of the WW1 centenary – see more about Percy Sweet here. Rifleman Percy Sweet was killed on the first day of the Battle of Arras in April, whilst serving with the London Regiment known as The London Rangers. 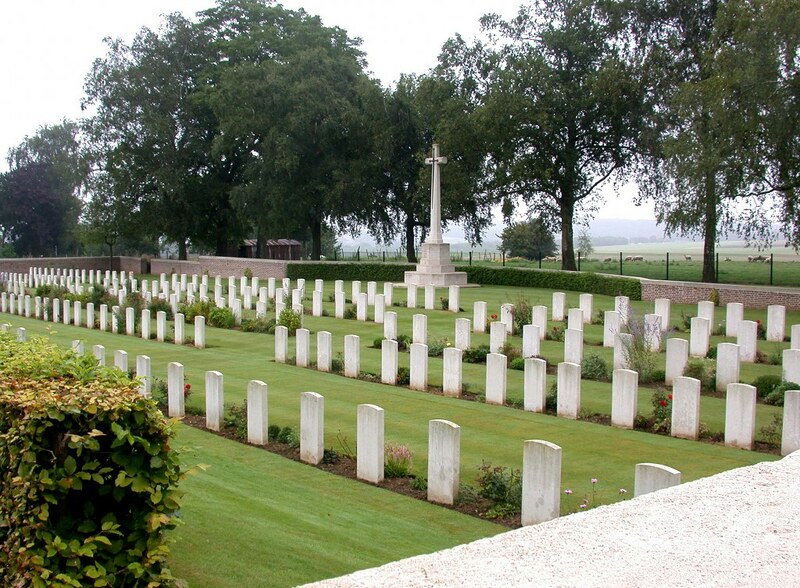 He was buried with many of his London Rangers comrades at the London Cemetery, Neuville Vitasse, Arras, France. So in Percy Sweet and Richard Stephens we have two later additions to the WW1 memorial, almost a century apart. 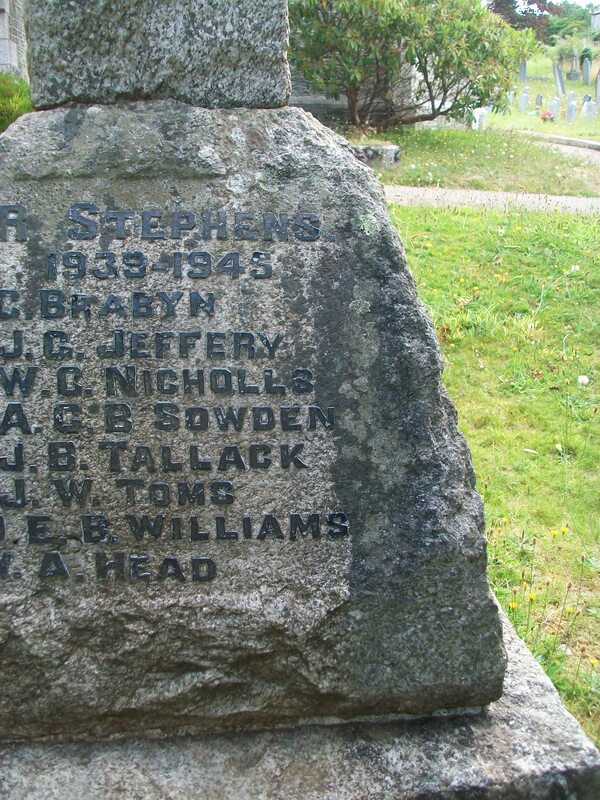 R. Stephens’ name added round the back section of Devoran war memorial, above the WW2 names. Frederick (Gordon) Webb, Sapper, 155779, 179 Tunnelling Company, Royal Engineers was killed on 18 July 1916, aged 41. 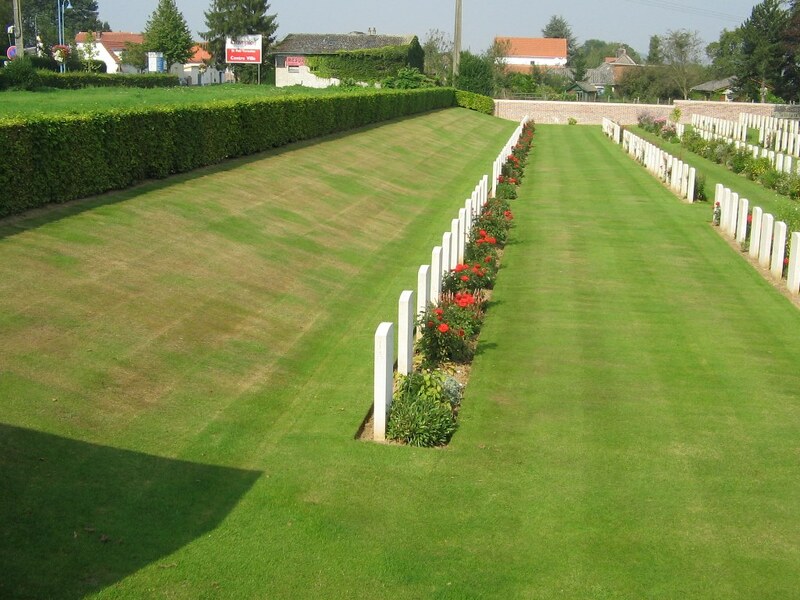 According to Simon Jones’ excellent website, Webb was a tunneler’s Mate and was “killed by enemy shrapnel whilst returning to billet after relief. 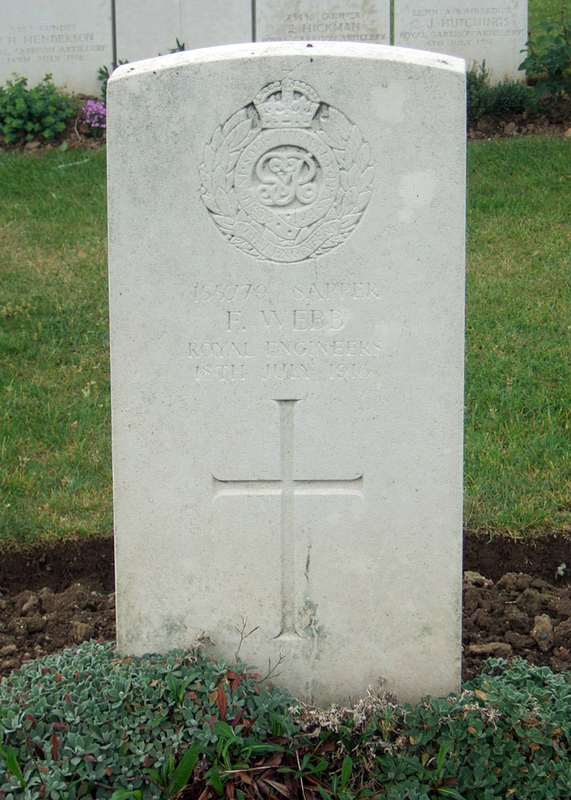 Davey wounded.” Webb is buried in Albert Communal Cemetery Extension, grave reference I.K.38. 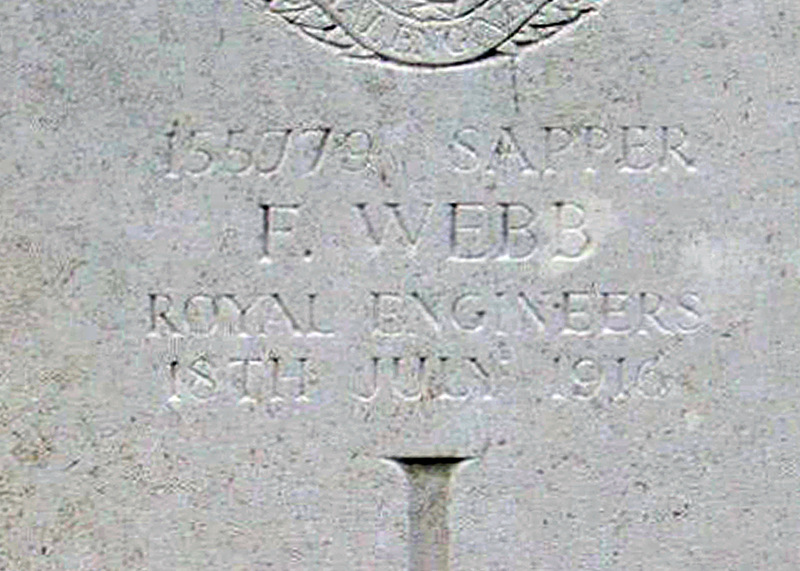 Sapper F. Webb is buried in the Albert Communal Cemetery Extension., Somme, France. Born in Truro, Webb was initially in the 3rd battalion Duke of Cornwall’s Light Infantry before the war ‘time expired’ and As a former soldier seems to have been part of the Special Reserve, so quickly rejoined the 1st Battalion, arriving in France on 20 January 1915. As a result he was awarded the 1914-15 Star along with the standard Victory and British Medal. Promoted Corporal by 12 December 1914, he was demoted to Private on April 1915 “reduced or misconduct – drunkenness” . 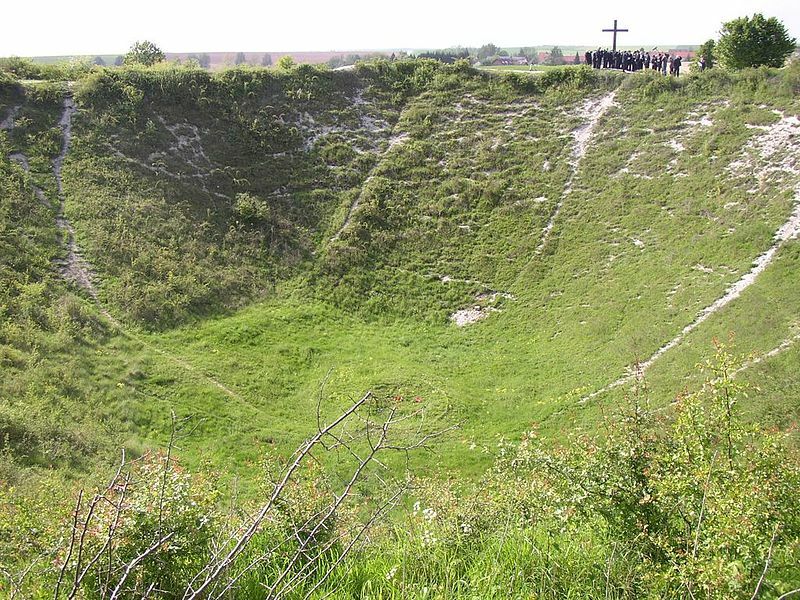 Webb was transferred to the 179 Tunnelling Company of the Royal Engineers, one of many infantry attached to the miners or tunnelers and survived long enough to see blown the huge mines under the German lines on the La Boiselle Sector on the First Day of the Somme, 1st July 1916. Married to (Edith) Maud or Maude Webb (nee Penhaligon, b. 1879) in Truro in 1901, he left 6 children. At the time of his death his wife was living (staying or working?) at the Crown and Anchor pub (now a house on Quay Road) in Devoran. Before marriage in 1901, she is listed on the 1901 Census as a (Temperance) Hotel Cook in the River Street Truro. Frederick Webb was listed as a Horse Driver and Waggonner / GWR Carrier with an address at 16 Edward Street, Truro. by the time that his medals were sent through and the complexities of pensions being paid to his wife, she was residing at 7 West Street, Penryn. Irene Sylvia, 5 August 1915. Interestingly Sapper Davey who was wounded alongside Webb, T Davey on 18 July 1916 is assumed to be 148552 or 148532 Joseph Davey, formerly 5400 Duke of Cornwall’s Light Infantry. Several other DCLI Cornishmen were also attached to 179 Tunneling Company, RE. .The underground war was powerfully portrayed in the novel and film of Sebastien Faulks’ Birdsong. More can be found about the Tunneling Companies and their underground mine warfare on Wikipedia and also at Simon Jones’ website. 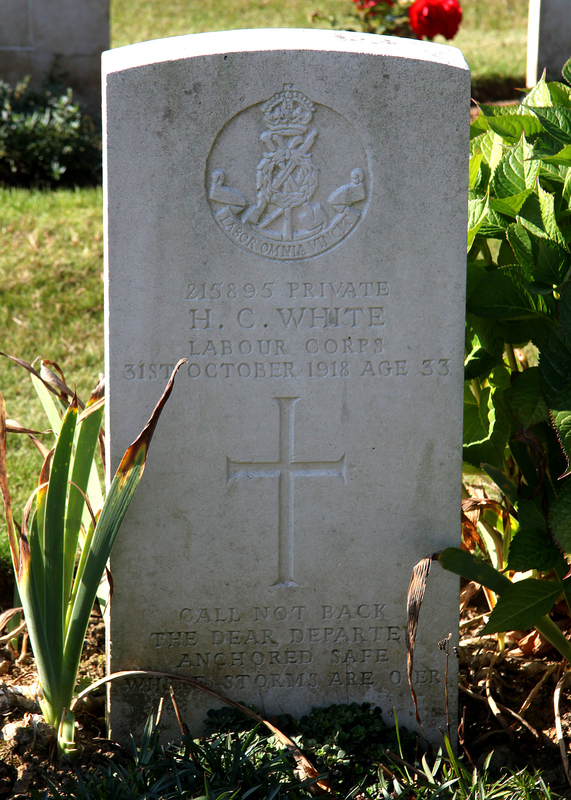 Henry Cecil White was a Private 215895, 745 Area Employment Company, Labour Corps who died 31 October 1918, aged 33. White is buried at II.C.16, St. Pol British Cemetery, St. Pol-sur-Ternoise, France. 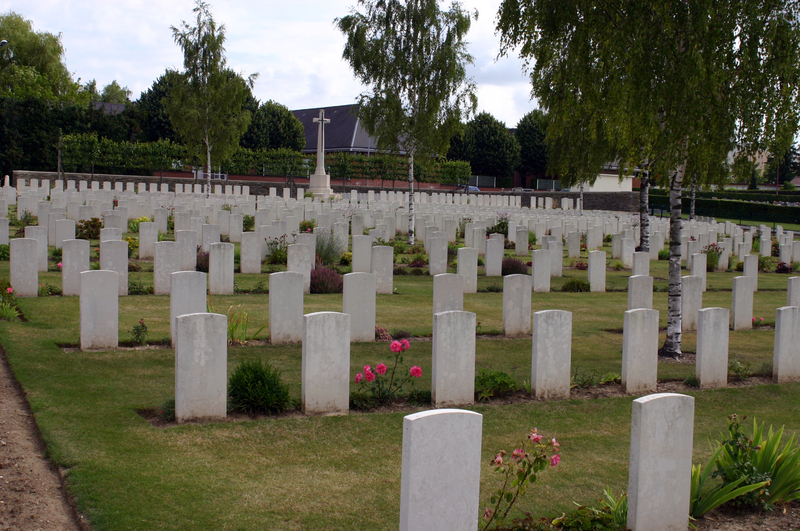 This cemetery was linked to No.12 Stationary Hospital. He is listed on the CWGC website as the son of Mr. W.H. and Mrs. E.A. White, Carnon Gate, Devoran, Cornwall. Henry Cecil White was born at Portland, Dorset in 1886. Living in Carnon Gate with his family, Henry became an apprentice at an iron foundry (fairly illegible 1901 census entry) along with his brother William C. White also born at Portland, Dorset in 1886. Brother Wiiliam became an apprentice wood pattern maker in a foundry, a job that took him to board and live like Henry did in Redruth by the 1911 census. Henry is listed as an Iron Moulder in the 1911 Census. Both brothers were single at the time of the 1911 census. 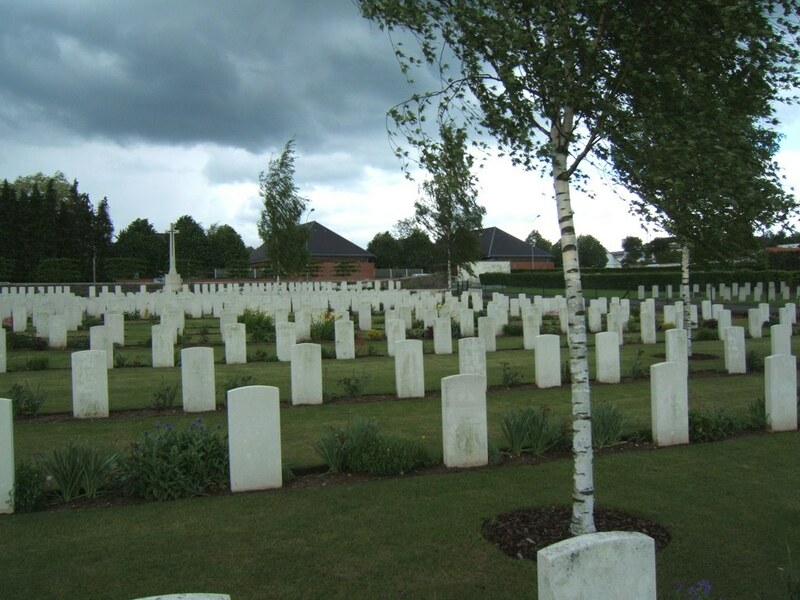 On his CWGC headstone (pictured at the website) can be found the following short verse chosen by his family: “Call not back/ the dear departed/ Anchored safe/ where storms are o’er”. Tony Dyson’s 2007 research notes that Henry Cecil White is remembered on the gravestone of his father in Devoran Churchyard, near the rear of the Parish Centre. 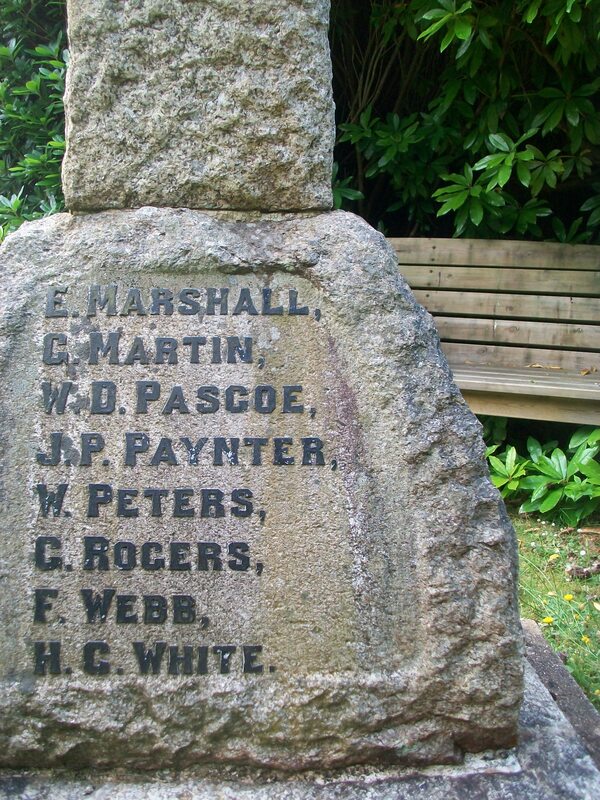 This entry was posted in Cornwall, Devoran, war memorial, WW1 and tagged Cornwall, Devoran, F G Webb, Great War, Percy Sweet, Richard Stephens, war memorial, WW1 on July 21, 2013 by worldwarzoogardener1939.